After a shocking season finale that fans are still talking about, anticipation has never been higher for The Walking Dead Season 7, slated to debut Sunday, October 23 at 9 PM ET on AMC. The season finale introduced the iconic villain Negan (Jeffrey Dean Morgan), who trapped Rick (Andrew Lincoln) and his group before killing one person, whose identity was not revealed. If you want to watch this iconic moment over and over again, along with the rest of the season, you're in luck, because we have a giveaway lined up where fans can win The Walking Dead Season 6 set on Blu-ray. This past season brought many unforeseen, exciting and pulse-pounding twists and turns. With the end of every season comes the bittersweet knowledge that we must wait with bated breath until the next ride. To keep your The Walking Dead appetite satiated, Anchor Bay Entertainment proudly continues the tradition of offering fans an opportunity to relive the ever-so-satisfying series by delivering The Walking Dead: The Complete Sixth Season on Blu-ray + Digital HD, and on DVD, on August 23. New cast members and guest stars for Season Six include Merritt Wever as Dr. Denise Cloyd, Ethan Embry as Carter, Corey Hawkins as Heath, Thomas Payne as Jesus and Jeffrey Dean Morgan as Negan. Season Six starts with Alexandria's safety shattered by multiple threats. To make it, the people of Alexandria will need to catch up with our survivors' hardness, while many of Rick's people will need to take a step back from the violence and pragmatism they've needed to embrace. These reversals won't happen easily, or without conflict. But now Rick's group is fighting for something more than survival...They're fighting for their home. And they will defend that at any cost, against any threat, even if that threat comes from within. Including never-before-heard audio commentaries, deleted scenes, six new featurettes, additional extras and the highly anticipated Alternate Negan Scene and a look back at the death of Nicolas, the Blu-ray and DVD will be available for the suggested retail price of $79.99 and $69.98, respectively. Just like the previous award-winning home entertainment releases, The Walking Dead: The Complete Sixth Season will take fans down The Walking Dead memory lane so they can relive all of the season's most haunting and indelible moments. 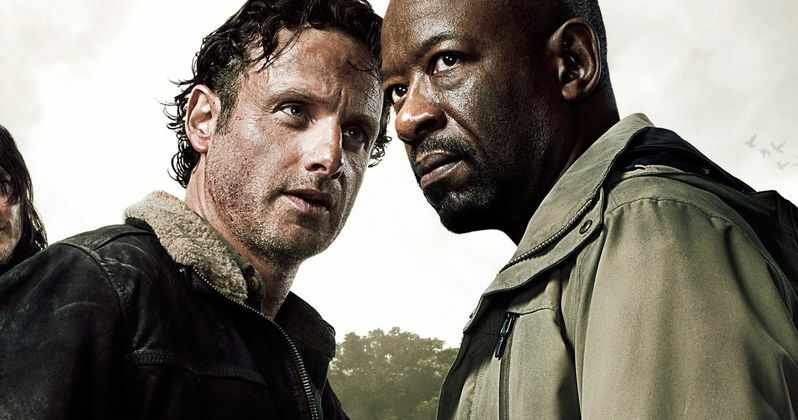 The Walking Dead: The Complete Sixth Season cast includes Andrew Lincoln, Norman Reedus, Steven Yeun, Lauren Cohan, Danai Gurira, Lennie James, Chandler Riggs, Melissa McBride, Sonequa Martin-Green, Seth Gilliam, Michael Cudlitz, Alanna Masterson, Christian Serratos, Josh McDermitt, Ross Marquand, Austin Nichols, Alexandra Breckenridge and Tovah Feldshuh. The Walking Dead: Season 7 premieres on AMC this October. If you want to bring this DVD set home, HERE'S HOW TO WIN! Just LIKE (fan) our Facebook page and then leave a comment below telling us why these prizes must be yours! If you already "Like", just leave a comment telling us why this DVD needs to be in your possession! Take a look at the trailer for The Walking Dead: The Complete Sixth Season below, and stay tuned for more on Season 7.